Don't Forget These Upcoming Cider Events! Schilling Cider launched their new “Northwest Sea to Sky” branding last month which was a collaborative effort between consumers and the company. The new brand was inspired by the diverse landscapes of the Pacific Northwest and the people who occupy those landscapes. Schilling Cider is all about creating ciders that are bold, innovative and reflective of their loyal patrons and now the new branding reflects this. 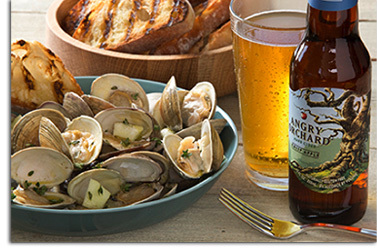 The design of the new brand was brought about from Schilling Ciders own customers’ voices. 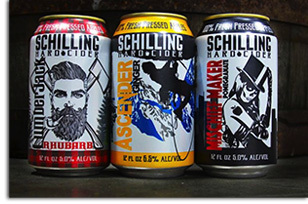 Patrons of Schilling Cider House, in Seattle, had the opportunity to see design concepts and mock-up packaging. They were then able to vote on what they liked, didn’t like and give reasons why to help with the finalization. Nature seemed to have a strong connection to not only the staff of Schilling Cider but their patrons hence artwork that includes rock climbing, mountains, woods, and more! Interesting note, each of the characters on the new packaging is reflective of someone in the company. In addition to the new 12oz can lineup, Schilling’s 16oz Cider Maker Select products will be sold in 16oz four packs under the new brand design. Further, due to the recent passing of the CIDER Act (Cider Industry Deserves Equal Rights), which lifted the barrier that previously kept carbonation levels low in cider, cider lovers can expect not only bold new flavors from Schilling Cider, but a more carbonated experience in select ciders. With all the change, don’t worry about the quality changing though! The ideals that supported the Schilling Spice Company, are the same ideals Schilling Cider operates under today. The company’s goal will always be to create quality ciders at a fair price which means creating ciders using only 100% fresh pressed locally-sourced apples, GMO-free ingredients, never back sweetening or adding anything artificial. Schilling flash pasteurizes their products but never uses scary chemicals. To see the new branding and learn more about Schilling Cider, please visit SchillingCider.com. Photos courtesy of Schilling Cider. A sense of community follows Urban Forage Winery and Cider House all the way down to their ingredients and the local environment. While many cider makers are going out of their way to make their cider with locally sourced ingredients, Urban Forage takes it a step further using not only local ingredients but also ingredients that would otherwise go to waste. 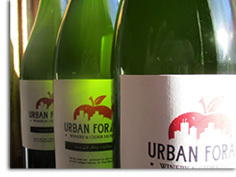 Since their opening in the fall of 2015, Urban Forage has been using “reclaimed” fruits to create their ciders. These “reclaimed” fruits are collected in a variety of ways. Some are acquired by harvesting local neighbor’s apples from their trees that would otherwise go to waste (with permission, of course), other fruits are saved from being waste at supermarkets in the area which look to get rid of old product. These fruits are all perfectly good to eat but due to regulations and extra precautions, they would otherwise get thrown out. Owners and cider makers, Jeff and Gita Zeitler began the company by crowd sourcing, being the product of a successful Go Fund Me campaign raising almost $24,000. This crowd sourcing is a concept that has obviously continued with the company building up Urban Forage’s connection with the community. Urban Forage has been busy since its opening and slowing down does not seem to be anywhere in the plans. At the moment cider can be purchased at their facility but with no actual tasting room, it is more of a carry out then a hang out and sample spot. Urban Forage plans to change this as soon as they can; they are looking to implement a tasting room in the fall of 2016 if all goes well. Tasting room or not, the cider is well worth the trip and the cherry apple cider will quench your taste buds yearning for new and unique cider flavors. 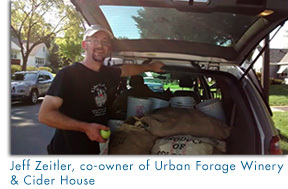 Be sure to check out Urban Forage at 3016 East Lake Street, Minneapolis, Minnesota or online at UrbanForageWinery.com. Photos courtesy of Urban Forage. Hard cider’s growth has been in large part due to the continued production of some large companies but also due to smaller, more local companies expanding their reach. We can’t cover every new distribution contract but here are just a few that were recently announced for consumers to look out for new ciders hitting their shelves! Ciderboys Launches Throughout Florida – Thanks to a new partnership with Cavalier Distributing, Ciderboys unique “fruitful pairings,” which blend unexpected fresh fruit flavors with the crisp taste of apple cider, are now available across the Sunshine State. The gluten-free, carbonated hard ciders from Ciderboys Cider Co. will be sold in six-packs of 12-ounce bottles at retail stores, and in select bars, taverns and restaurants on draft or in bottles. Year-round flavors First Press, a traditional hard cider, and Strawberry Magic, a blend of apple cider and strawberries, are also available in 12-packs and 12-ounce cans. “Florida is a perfect market for Ciderboys refreshing hard ciders, and Cavalier Distributing, with a well-founded reputation as a craft beer authority, is the right partner to ensure Ciderboys products will be as popular and successful in the Sunshine State as they are elsewhere,” said Julie Birrenkott, Ciderboys Marketing Director. Florida joins 26 other states where Ciderboys hard ciders are sold. Cincinnati Cidergeist Expands to East Coast – Rhinegeist, the Cincinnati craft brewery that owns and manages the Cidergeist brand, has just launched distribution of its hard ciders in Boston through the Massachusetts Beverage Alliance. Cidergeist’s dry-hopped and semi dry ciders will be available on draft and in 12-ounce six packs in Massachusetts bars, restaurants, liquor and grocery stores beginning March 1. If all goes well, New York distribution will not be far behind. Flatbed Cider Begins Distribution to Oregon and Washington – Launched in January, Flatbed Cider Co. offers consumers an all-new craft cider made from the apples that made the Northwest famous around the world. The company’s two offers, a Crisp Apple Cider and a Pear Cider, are now available at restaurants and retailers throughout Washington State and Oregon via Ste. Michelle Wine Estates. For those not familiar with Flatbed Cider, the Crisp Apple Cider has a drier taste profile than most widely-available ciders in the U.S. Jonagold apples picked at their peak deliver the balance and acidity behind Flatbed’s exceptionally bright taste while Red Delicious apples provide tannin structure. Golden Delicious apples add a rustic apple character with a twist of subtle sweetness. And, heirloom varietals like Newtown Pippins and Gravensteins – which are hand-selected from batch-to-batch – add bucolic Northwest charm to the blend. The Flatbed Pear Cider features Northwest-grown Bartlett pears for a burst of crisp, sparkling refreshment with a clean finish. Naturally sweeter than its Crisp Apple cousin (but not too sweet), this pear cider is the perfect choice for taming spicy foods and classing up a donut. Both the pear cider and the Crisp Apple are available in 6-packs of 12-ounce bottles for the suggested retail price of $10.99. Starcut Ciders Announces Illinois Distributor – Short’s Brewing Company based in Michigan, announced in January that it would begin distribution outside of Michigan in Illinois through Breakthru Beverage Group. Breakthru plans to distribute Short’s brews including Soft Parade, Huma Lupa Licious, and Space Rock. It also will handle some seasonal beers and will distribute Short’s hard cider brand, Starcut ciders, including Pulsar and Octorock. Starcut Ciders actually became available for order in Illinois beginning this month; meanwhile, Short’s beers will be available sometime in March. 2 Towns Ciderhouse to Bring Craft Cider to Greater Los Angeles – 2 Towns Ciderhouse announced its partnership with Craft LA, a Los Angeles area distribution company, that will distribute 2 Towns cider throughout the LA area including Los Angeles, Riverside, Ventura, Santa Barbara, and San Bernadino counties. Craft LA will carry the full 2 Towns Ciderhouse line plus seasonal ciders; and will also distribute limited-release ciders that previously have included ingredients such as Southern California’s prolific prickly pear. Pittsburgh, Pennsylvania, has been known for many things throughout the years but one thing that doesn’t usually come to mind is whiskey. Despite this fact being lost in history, Pittsburgh is actually the birthplace of American whiskey, and the place it all came to a head before it created quite a controversy. In the late 1700’s George Washington decided to tax whiskey, marking the first time a tax had ever been implemented on a domestic product. In those times, whiskey was the go to spirit for most Americans. This tax greatly affected the Pittsburgh market and it quickly caused protests. With distillers refusing to pay the whiskey tax, it did not take long until these protests became violent. As a show of force, Washington pointed his militia toward Pittsburgh in an event which would mark what would later be known as the “whiskey rebellion.” Fast forward to Pittsburgh a few centuries later, and you find Wigle Whiskey Distillery paying homage to the city’s distilled roots with their line of whiskeys as well as a multitude of other craft liquors. Though, just like the distillers of the 18th century, Wigle refuses to be told what to do, which is why they have decided to branch out into their newest endeavor, hard cider. Wigle will be putting all of their craft knowledge and passion into a completely new artisanal market with Threadbare Hard Cider. Threadbare Hard Cider is slated to be open in November 2016 but the buzz and anticipation is already building for the new cider company. The first hurdle Wigle had to overcome in order to jump into the hard cider market was space. With Wigle almost ready to outgrow their current facility they purchased in 2014, there was no way they could begin to produce hard cider in the same location. The search was on for a viable new place to put their brand new cidery, which the company found within the Strip District of Pittsburgh. The building the Wigle owners chose was a 150-year-old tannery that the team has plans to convert into a production area, barrel house, tasting room, and venue for live acts! Just as the distillery does, Threadbare plans to source all of their cider making ingredients locally to help the local Pittsburgh market thrive. At this moment there is no word on what types of ciders will be flowing out of this cidery come November but if Threadbare pulls from the same creative minds as Wigle, there is no doubt the cider will be anything less than delicious and innovative. With all of this cider soon to be produced and whiskey barrels easily attainable, it will be interesting to see if Threadbare ever treats its cider to the whiskey aging treatment Wigle has come to master; only time will tell. 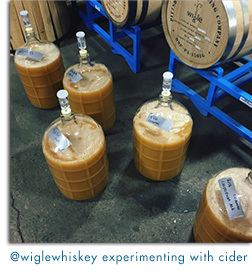 Until the cidery opens and the taps run with delicious Pittsburgh cider, apple lovers will have to wet their pallets with Wigle’s Apple Whiskey, which is a treat all by itself. Want to know more about Wigle and Threadbare Hard Cider? Visit Wigle for tastings at 2401 Smallman Street, Pittsburgh, PA 15222 or check them out online at WigleWhiskey.com. 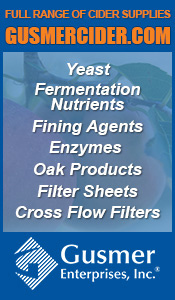 If hard cider is all you fancy, navigate over to ThreadbareCider.com and sign up to receive updates on the upcoming cidery and all of its progress. 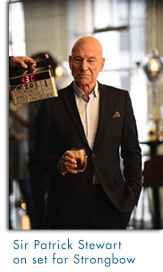 Strongbow Hard Apple Ciders, announced the launch of its latest television commercial campaign starring legendary actor Sir Patrick Stewart. The humorous new commercials will showcase Strongbow’s award-winning range of flavors by poking fun at Sir Patrick Stewart’s impressive acting range. The ads follow the brand’s highly successful 2015 “All You Need is Ice” campaign, which highlighted how Strongbow over ice is the “bestest” cider, to a point that a celebrity of the Sir Patrick’s caliber is not required to get consumers to try it. Strongbow’s new 2016 “Impressive Range” campaign includes multiple new spots, the first of which has debuted digitally on the brand’s YouTube page and will begin airing on TV nationally March 7th. The launch will be supported through a mix of traditional and paid media, digital, PR and experiential marketing with the remaining spots launching later this summer. Click here to view the first spot. The witty campaign was created with Strongbow’s agency partner, Droga5. For additional information or to find Strongbow near you, please visit Strongbow.com. Many 2016 hard cider events have already been announced but here are just a few around the corner. Don’t delay in getting your tickets! On February 27th, join Nine Pin Cider and 11 of New York’s other farm cideries as they team up to offer you the tasting and farm market experience that only the State of New York can offer. Sample unique batches of ciders all made from New York apples and purchase cider by the glass, growler, or bottles to go! This limited ticketed event with two sessions (12-3PM and 4-7PM) is expected to sell out. Tickets are $15 in advance and can be purchased by clicking here. This year’s Cider Summit Chicago will be taking place on February 27, 2016 in two sessions – 11AM to 3PM and 4PM to 8PM. 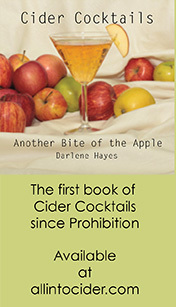 Owners and cider makers of various cideries will be on hand to inform and guide guests through the samplings which will be available in 4-ounce portions. Cider Summit will feature over 140 ciders including regional favorites and international classics from countries such as England, Scotland, France and Spain. 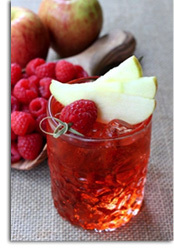 The event will also feature specially selected food pairings, a new Cider Cocktail Lounge hosted by The Northman and Woodford Reserve, and an event store featuring Cider Summit shirts and other merchandise. Another new feature at the 2016 event will be the Fruit Cider Challenge sponsored by Oregon Fruit Products. Several of the participating cideries will produce pilot batches specifically for the event and consumers will have the opportunity to vote for their favorite during the festival. The winner of the first annual Fruit Cider Challenge will be announced at the conclusion of the event. All tickets will be sold in advance online via CiderSummit.com. General admission tickets are $35 and include a souvenir tasting glass, eight tasting tickets and a $1 donation to Heartland Alliance. A limited number of VIP tickets are available for $40 and include express entry and two additional tasting tickets. Designated Driver tickets are available for $5 (as walk-up, on event day only), and include a bottle of water. A separate ticket is required for each session. The event is strictly 21 and over – no exceptions. Vermont Cider Week is a collaborative effort between Vermont craft cider makers to showcase the hard cider produced in Vermont. 17 cider producers will be hosting numerous events throughout the state from tap takeovers, limited edition tastings, pairing dinners, and more. Some special events include a Sip & Skate on February 27th, Vermont’s Birthday Bash on March 4th, and the Harley Davidson Ciderfest on March 5th. Visit VermontCiderWeek.com for additional information. 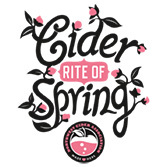 The Northwest Cider Association’s 3rd Annual Cider Rite of Spring returns t o Portland, Saturday, March 19th with top cidermakers, a cider store and more. 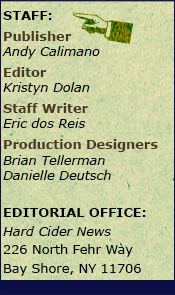 Lauded as the “Best Northwest Cider Festival” by SIP Northwest in 2015, 27 Northwest cideries are already confirmed with more to be added as the date approaches, key an eye on NWCider.com for updates. Tickets are $30 at the door and $25 in advance. Northwest Cider Association (NWCA) current members get tickets for the discounted rate of $20. Visit NWCider.com or click here to buy tickets and obtain additional information. Attendees must be 21 and over. Ticketholders will receive a glass and eight tasting tickets. Food will be available for purchase with live music throughout the event. A pop-up retail store will give attendees the chance to buy their favorite ciders from the event to take home.